While boxing fans would like to see IBF light heavyweight champion Bernard Hopkins to step it up from the likes of Karo Murat and Tavoris Cloud to fight the best in the division in Adonis Stevenson and Sergey Kovalev, Hopkins said that he’s interested in moving down in weight to fight Floyd Mayweather Jr. next. Hopkins feels he can get down to 160 by next May to fight Mayweather in Cinco de Mayo if they can negotiate the fight. As for fighting Kovalev or Stevenson, Hopkins feels that the fights can’t get made due to him fighting on Showtime and Kovalev and Stevenson fighting on HBO. I think every reporter would count Hopkins out against Mayweather at 160. Hopkins looked slow and old last night against a weak opponent. If he’s forced to lose 15 pounds to get down to 160, he’s going to likely be far worse due to the weight loss. I don’t know of anyone with knowledge of the game that thinks Hopkins could pot shot his way to victory over Mayweather. 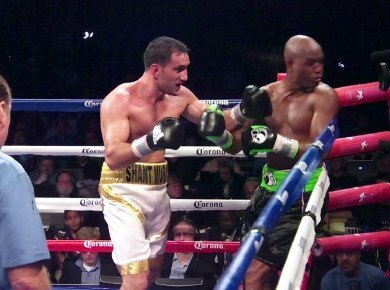 Hopkins was basically pot shotting Murat last night in his 12 round decision victory. Hopkins didn’t throw a lot of punches because frankly, he can’t throw a lot of punches anymore. He’ll be 49 in January, and he doesn’t have the motor to throw a ton of punches anymore and he’s too slow to beat Mayweather. Golden Boy Promotions will likely try and convince Mayweather the logic in him fighting the 49-year-old Hopkins next May, but I don’t think he’ll do it because it’s a no-win fight for him. If Mayweather looks great, then it was because Hopkins was weight-drained or too old. If Mayweather struggles to win or gets beaten, then Hopkins gets all the credit and his legacy is enhanced. Of course, if Mayweather only cares about the size of his paycheck for the bout then he might say yes to such a fight but that’s about the only way he would agree to a Hopkins match-up. Even if Mayweather agreed to come up to 160 for the fight, he’d be giving away a ton of weight and reach to Hopkins. Hopkins said after the fight that he’s loyal to Showtime. In other words, no Kovalev or Stevenson fight. What that means is that unless Hopkins can get a fight against Carl Froch or Lucian Bute, then he’s likely going to spend the remainder of his career defending his IBF 175 lb. title against the Karo Murat types. He’s not shown interest in fighting Beibut Shumenov, and it’s doubtful he’s bother fighting Nathan Cleverly now that he’s been exposed. So what we’re probably going to be seeing is Hopkins defending his title against the little known opposition that the IBF has ranked at 175 in their top 15. There is a chance Froch could fight Hopkins, but I doubt a fight between then will happen anytime soon, at least not in time for Hopkins’ next fight. If Hopkins is willing to wait for a while, he might get a fight with Froch or Lucian Bute. An interesting fight against Jean Pascal would be a nice one for Hopkins because they’ve alreadt fought twice and they draw a lot of fans in Canada.